How Artificial Intelligence is Changing Mobile App Development? Mobile app development is revolutionizing our lives turning impossible into reality. What’s next in this fascinating journey of mobile development? Artificial Intelligence (AI) seems to be unanimous choice of industry analysts. Right from chatbots, context-aware smart sensors to predictive analytics, developers and businesses are exploring innovative ways to utilize Artificial intelligence to deliver better customer service, new products and reimagine business processes. Artificial Intelligence and machine learning is causing an unprecedented change in the way that developers, businesses, and users think about modeling algorithms and intelligent interactions within applications. Machine learning is no longer in its nascent phase. Users now want flexible algorithms for seamless experiences. The new availability and advancement of AI is bringing about incredible change in the way that developers, businesses, and users think about intelligent interactions within mobile applications. AI has not suddenly appeared in the application development scene. It has become noticeable to users in the form of Apple’s Siri. According to Gartner’s Top 10 Strategic Technology Trends for 2017, “Intelligent Apps” is one of the top trends to watch out for 2017. Technologies like virtual personal assistants (VPAs) can make everyday tasks easier such as prioritizing emails and highlighting important content and interactions. Gartner also estimates that 6 billion connected “things” such as connected appliances, cars, wearables, and smart devices will be needing support from AI platforms by 2018. But Artificial Intelligence is virtually making its way in different categories such as security tooling and enterprise applications. By 2018, most of the world’s largest 200 companies will exploit intelligent apps and utilize the full toolkit of big data and analytics tools to refine their offers and improve customer experience. With the advancements in AI, mobile app developers today spend a lot more time thinking about how to collect, sort and store the data that their applications gather so they can feed it into the machine learning algorithm compared to standard static algorithm that does not change. AI technologies are beginning to take hold in a variety of industries. eBay, Amazon and other giants in the retail industry have already proved the success of AI mobile apps. Many devices and applications will be written with algorithms that adapt and adjust based on observed behavior. Businesses can leverage the data collecting via point-of-sale machines, online traffic, mobile devices, and more. The algorithms will shift through this data collected, finding trends and adjusting apps to create more rich contextual and personalized experiences. Starbucks AI-powered mobile app “My Starbucks Barista lets users tell the app what they want and the app places order for them. AI-infused “smart apps” help users to complete daily tasks in an effortless manner. Mobile app developers are defying limits by using AI for enhanced personal experiences to the users. Launch of Amazon Alexa, a voice controlled digital home assistance allows users to take control of regular chores of the users automatically. The increasing use of AI in mobile app development services has proved its importance in the business growth and user engagement. Many devices and applications with a fixed algorithm do not adjust based on user’s observed behavior. Here is how AI helps overcome this barrier. AI collects and stores data from user by analyzing the behavior and usage pattern of the app. Integration of AI in products to generate maximum revenue with satisfactory and user-friendly UI. This will profit the business in terms of high user engagement with improved involvement. This is where things will change as we get more AI and machine learning-driven apps. Siri, Google Assistant, and Cortana from Microsoft are examples of trending mobile app technologies with AI. AI has been heavily influential in app development for several years already, beginning with Apple’s Siri . There is tremendous potential to reach new level of sophistication. 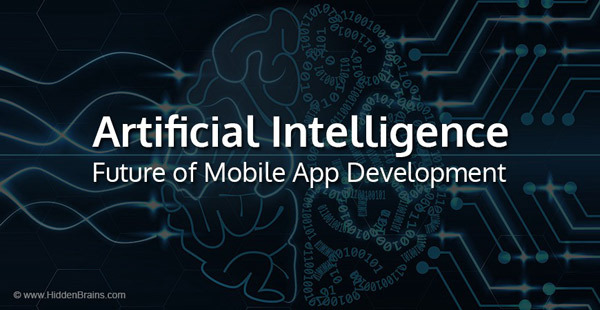 The growth of artificial intelligence is empowering new possibilities in mobile app development.